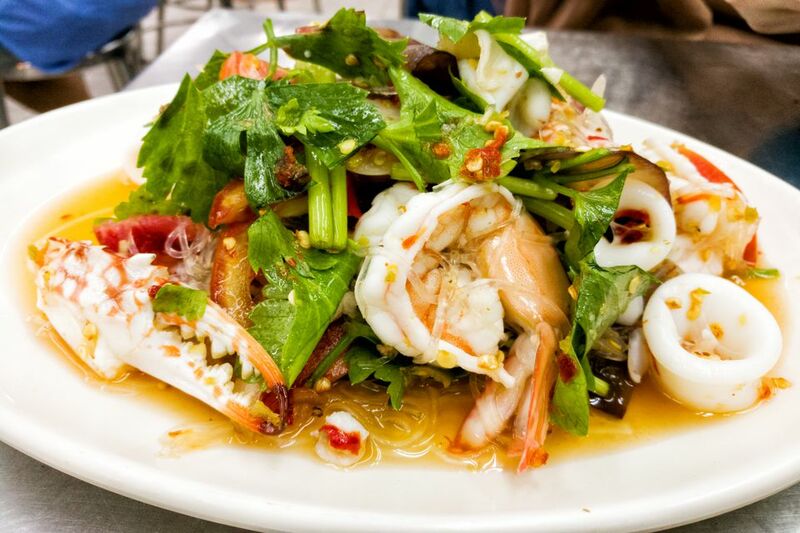 Tasty Thai combines squid (calamari), juice, sweet onions, carrots, lettuce, mint, and cilantro. Adjust the amount of red pepper to suit your personal spicy meter. In 4-quart saucepan, combine 3 quarts water and 2 teaspoons salt; heat to boiling over high heat. Meanwhile, in a large bowl, combine fish sauce, juice, sugar, crushed red pepper, and remaining 1/4 teaspoon salt and stir until sugar has dissolved. Stir in sweet onions and carrot. Rinse squid under cold running water. Slice squid bodies crosswise into very thin rings. Cut tentacles into several pieces if large. Add to boiling water and cook until tender and opaque, 30 seconds to 1 minute. Drain and add to dressing in bowl. Add lettuce, mint, and cilantro. Toss until mixed and coated with dressing.